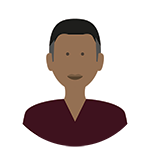 Medicines support for adults may be provided by a number of different people, including family, healthcare professionals and homecare staff. It is essential to be clear about what support is needed and who will provide it. As far as possible, the person should manage their medicines themselves. 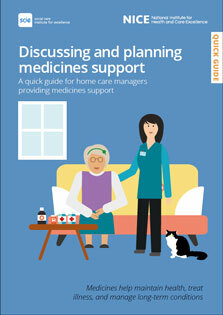 Where it has been agreed that medicines support will be provided as part of a homecare service, it may be helpful to think about the following areas. Medicines help maintain health, treat illness, and manage long-term conditions. What medicines do they use and when? Why do they take these medicines? How do they currently manage and store them? Does their ability to make daily decisions about their medicines change? Think about the things that might affect the type, amount, or timing of support the person needs. Make sure it is clear who has responsibility for the medicines. Record the discussion and any decisions made. Are the medicines tablets, creams, patches, inhalers, eye drops, or liquids? Are there any special instructions to follow, or any devices used to help administer the medicines – e.g. an oral syringe or eye drop dispenser? Are any medicines needed at a particular time ? Are any medicines taken ‘when required’? Do they take any over-the-counter or herbal medicines, or nutritional supplements? Who will order and collect or deliver the medicines? The support the person requires for each medicine, taking their preferences into account. What the care worker needs to do to give that support. How the care worker will get consent for decisions about medicines. Accurate, up-to-date and accessible details of the support given for each medicine on every occasion it is provided. the person experiences a major change in their life. consider if a review might be needed and if any medicine can be stopped. 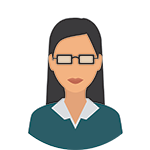 training and assessing the competence of staff. 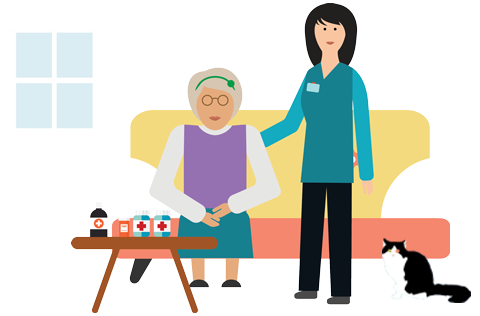 This content has been co-produced by NICE and SCIE and is based on NICE’s guideline and quality standard on managing medicines for adults receiving social care in the community.